Sorry, we love pets but they're not permitted at the park. Hey, my name is Evan. I am proud to be the Honorary Chair for the 2019 Gutsy Walk in Ottawa. I’m participating in the Gutsy Walk this year to raise money and awareness for people with inflammatory bowel disease (IBD) just like me. I know how much of an impact it can have on people’s lives, and I want to help make it stop. I was diagnosed in November of 2016 at the age of 10, although we suspect I have had it for much longer. Crohn’s disease made me really sick. Because of the inflammation in my colon, I had a lot of stomach pain, I was in the bathroom all the time, I was always tired and I lost a lot of weight. IBD makes it hard for kids to grow because the inflammation prevents nutrients from being absorbed. I also had a lot of joint pain so it was hard for me to walk. Running and playing with my friends was almost impossible. I ended up in the hospital for weeks when I was at my worst. I also missed a lot of school. I was sick for a long time, but I am now in remission thanks to all of the wonderful treatment options that are available. I have to go to a clinic for infusions every eight weeks but I don’t mind because my medication has changed my life. I am lucky because there weren’t always a lot of options, but things like the Gutsy Walk made more research possible so that new treatments can be found. 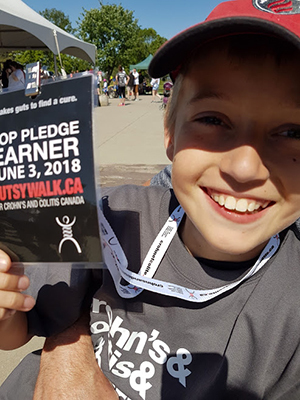 The money from the Gutsy Walk goes directly to funding research and other support programs for kids and adults with Crohn’s or colitis. Now that I’m in remission, I can participate in lots of physical activities and programs. I currently do archery, curling and parkour, plus it’s easier to play with my friends at school. I also go downhill skiing and I like to skate and play outside whenever I can. Being healthy has really changed my life and made me happier, and I want everyone with IBD to be healthy like me. Support and understanding is really important when you have a disease like this, and the best way to get that is to be around people that have the same illness as you. This is why Crohn’s and Colitis Canada runs Camp Got2Go every year. For two years in a row now, I have attended the one-week camp, which is in Nova Scotia. I’ve also attended shorter weekend camps that are run in Ontario. The first time I went completely changed my outlook on my life with Crohn’s, and I had such a great time that I just knew I had to go again. Crohn’s and Colitis Canada has helped me feel connected to other kids with IBD. This helps me when I’m feeling down. They also help raise money to find a cure which gives me hope that one day I won’t need to be on my medication. I think I would be having a much harder time if it wasn’t for the all the things Crohn’s and Colitis Canada does for people that live with these diseases. I’m proud to represent this organization and I am looking forward to helping in any way possible. I’ll see you at the Gutsy Walk and together, we can make it the best walk yet!! !